You will want a few buildings, certain follower traits, and Harrison Jones in your garrison. And an addon. The inn, so you can recruit followers with the Treasure Hunter trait. A follower with this trait adds 100% to the base gold value of the mission, so your 100 gold mission becomes 200. You will also want to get Harrison Jones as your follower. He’ll appear near the mission table, occasionally, in your level 3 garrison and offer you missions. Do all six and he’s yours. He not only has Treasure Finder, but he has a mentor ability, which will let you rapidly level your new recruits. The Salvage Yard will let you earn Salvage from missions and then vendor or auction what you collect. The War Mill, for items to boost your followers. The Mine – Ores so sell quite well. The Herb Garden – Herbs also sell well. If you’re a crafter you will want both the profession hut for your craft and a follower with that profession trait. The Master Plan addon. Get it from Curse or Forge. It cleans up your missions finder, adds info,and speeds things up nicely. See the bottom of the page for a “how to” video. Naturally you’ll want to get your followers to level 100 and epic. Then keep working on raising their item level, which will give you access to better missions. There are two ways to get extra gold from your missions. The most obvious one is the missions with a gold reward. 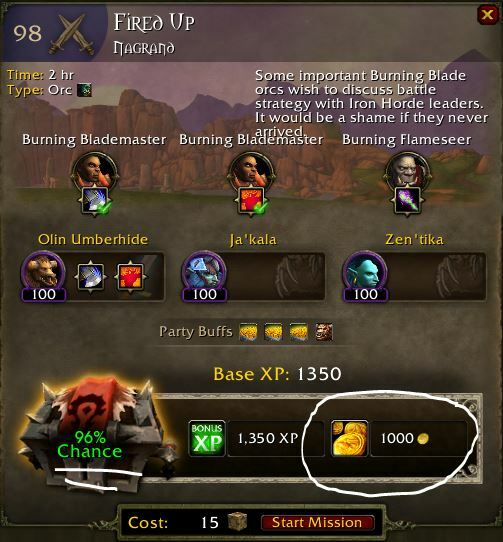 Some mission pops up with a 100 gold reward, you add the followers, and hit “Go!” The other is from Salvage. Now, if your followers have the treasure hunter trait you’ll get more gold, +100% of the base amount. If you have a 100 gold mission, requiring three followers, and you send three Treasure Hunters, then the mission is worth 400 gold. Do it with a 500 gold mission and you have 2k gold. The reliable way to get the trait is through your inn, specifically looking for followers with the Treasure Finder trait. BTW – if you’re in need of Garrison Resources you can hire followers with the Scavanger trail, which works exactly the same way. 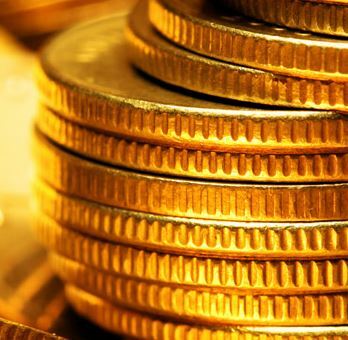 It just adds to the resources found instead of the gold. The other way to get Treasure Finder is through luck. Follower traits are mostly random. You can get lucky and find that trait on the newly obtained follower, or you can reroll his stats (make sure your reroll item rerolls traits, not just abilities) and hope for the best. The other way to get mission gold is through Salvage, which you will get if you have the Salvage Yard. You will be able to collect Salvage from your missions and each box of salvage contains random stuff. You will have to actually be in your mill to extract the items from your salvage. Unwrapping several boxes of salvage will give you some materials (ore, herbs, etc.,) a pile of gray items, a number of green B on E items, occasional blue B on E items, and occasional BoP items that are 610 item level. You can sell any or all of it to the vendor there. You will also get items to boost your followers’ gear levels. Your call if you want to try and sell the B on E items, I haven’t had much luck with them, but maybe yours will be better. Some certainly look good for Transmog. You can make various raid quality (Ok, entry raid quality) items with the crafting professions, such as item level 630 weapons and 645 armor, trinkets, and jewelry. You can also make the items that will reroll stats on those items as well as to boost their item level. IN patch 6.2 you’ll be able to boost that armor to 715 and the weapons to 705. Definitely raid quality. They’ll probably sell, too. Just keep track of your costs if you buy any of the materials. The primary materials seeded for these things come from a daily cooldown and from your work orders. Having a follower in your profession building will double the amount of materials from the work orders. The basic gear pretty much just needs those daily materials, but the items to boost those pieces will require more of the same stuff, plus Savage Blood, plus Sorcerous Elements. They do, however, seem to sell better than the basic armor or weapons and for a much higher price. Since the items crafted have random stats it makes some sense to have an item that will reroll those stats. You will be able to make such items. They sell decently well, but not at a high price. Still, they’re a lot cheaper to make than the pieces that boost item level. Keep an eye on prices and costs. This makes the act of gathering stuff easy, especially since you don’t need the skill. You get the full herbs/ores (not just pieces) and, if you’re leveling, you still get the XP from gathering them. The herbs, ores, and skins sell very well. Do you have an excess of Primal Spirits that you’re not otherwise going to use? Trade them to your garrison vendor for Savage blood (better cost to benefit ratio that the other materials sold) and sell that blood on the Auction House. Zygor’s Gold Guide will be a big help for crafting, gathering (outside of your Garrison,) and much more. Check it out, watch the videos, and see if it fits with your style. Go here. One thing I’ll add. When he’s putting together mission teams, in the video below, he’s doing it wrong. Look at the top right of the mission screen and you’ll see a small green button. Hover on it and it’ll show you your best mission teams. Just click your pick from the available choices and it will autofill the missions for you. Notice that it shows the amount of resource to be gained, the chance of completion, and the length of time of the mission. So here it’s a resource gathering mission with one or two scavengers. I went for the 87% mission (two scavangers,) though the one with 350 resources (only one follower with the scavenger trait there) has a 100% chance. 87% is still pretty good odds. Completed some missions for a total of 825 gold. Not bad at all. Two clicks to complete all of the missions and collect the rewards.